I’m a big fan of “gooey” chicken with soup and rice. And the picture of this looks so fancy for something so easy and quick. Bring worlds of deliciousness together with our Crisp and Creamy Baked Chicken Recipe. 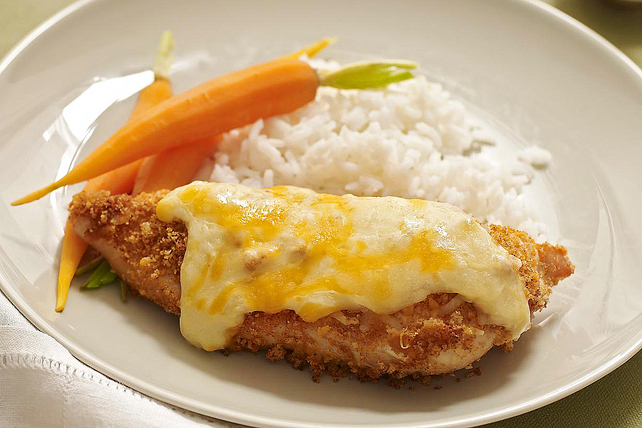 This baked chicken recipe is a tasty, cheesy delight to behold. Coat chicken with coating mix as directed on package; place in 13×9-inch baking dish sprayed with cooking spray. Discard any remaining coating mix. Bake 20 min. or until chicken is done (165°F). Meanwhile, cook rice as directed on package, omitting salt. Mix soup and milk until blended; pour over chicken. Top with cheese. Bake 5 min. or until cheese is melted and sauce is hot and bubbly. Serve with rice. This entry was posted in Writing Life and tagged characters, food, new release, recipe, Red Dirt Royalty, Tuesday Treats. Bookmark the permalink. Yum! I’m a big fan of chicken with soup and rice. I usually use cream of mushroom. And I actually have chicken defrosted for today’s dinner. I was planning stir fry, but maybe I’ll do this instead. Mmmm.